Nose: Nutty, vanilla, oak. Wood varnish solvent. Bourbonish. Palate: Initially, a dry and nutty attack, like a bourbon. Then lots of sweetness and vanilla oakiness. Quite unusual, like a cross between a speysider and a bourbon (but never as cloyingly sweet and resiny as some). A bit sherried, some almonds, cedar and acetone. Very appetizing. A bit thin and metallic, even slightly acidic. It should appeal to Jack Daniels fans. Finish: Nutty, with dried grapes and an almost perfumy echo. A little burn, which surprises considering the smooth palate. Dry. Comment: No great evolution with time in the glass, and perhaps too bourbonish and with excessive cedary and acetone notes. Definitely interesting, but on the long run perhaps a bit cloying and unbalanced. Score: 81 points. Nose: Heavy dried and candied fruits, burnt sugar, acetone and freshly sawn wood. Palate: Overwhelmingly sweet and intense, with lots of candy floss, burnt sugar, dark chocolate and nuts. Maybe a whiff of peat? Some licorice and gentian root, too. Finish: Tannins raise their head, but they are quite well-behaved, with no late bitterness. Comment: Again, another definitely interesting but weird malt. Difficult to mistake this for a Scotch: it has bourbony notes, it’s not the most typical Japanese malt, either, but it certainly avoids direct comparison with any other thing I have tried so far. Score: 84 points. I later discovered that this “From the barrel” was actually a blend, which I would have never suspected from its taste profile! 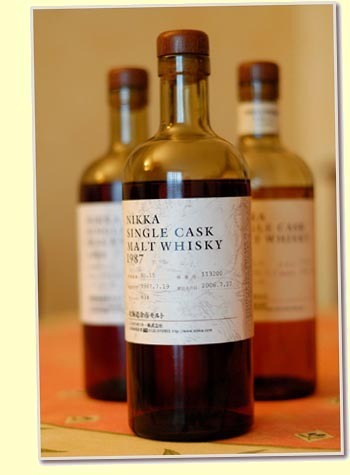 Yes, it’s a blend of malts from the Sendai and Yoichi distilleries, and a grain whisky. Ok, maybe someday when I will have some spare cash I should actually try that Hibiki, since it seems that the concept of blend in Japan might actually be better than that of the Scots… Some months later, after the surprising results of the 2006 Malt Maniacs Awards, I felt that I had to explore this world further. Nose: Bananas, candied oranges, ripe apples, blossoming roses, nail varnish. A faint whiff of peat. Vanilla, again like in bourbon (but not as intensely woody as in Yamazaki 12, and in this case not cedary at all). Young wood furniture. Palate: Sweetly malty, with the faintest of peat. Reminiscent of Bunnahabhain, perhaps, or a Balvenie 10 Founder’s Reserve. Not particularly complex, but sort of “pure”, cerealish and clean, with no frills or evident flaws. Finish: Mineral, malty, clean and increasingly spicy and slightly peppery. Comment: A very “plain” malt but in the good sense of the word, meaning that it doesn’t relay on big sherry, strong peat or other extravagances to capture the palate. And yet, it captures it indeed: a good “natural” experience, neither too delicate nor too overwhelming, simply very well balanced. Score: 84 points. Nose: White wine, aromatic herbs, coriander, damp earth, crème brulèe, tonic water, dry and slightly bitter (orange peel). Not the most expressive nose among these Japanese malts, quite restrained. But give it time and it gets pleasant and oakier. Palate: Dry and slightly bitter at first (again, classic Schweppes tonic water), then gets sweeter and malty, with banana, vanilla and “Sprite”, but still on the bitter side like a fresh lager beer. Not a lot of flavor evolution but interesting. Finish: Slightly smoky, malty. Some mint and candied orange. Again, slightly and stimulatingly bitter. Comment: Intense on the palate, but with a slightly limited flavour palette. Quite austere but not unpleasant at all. Score: 83 points. Nose: Haha, this is evidently sherry matured (or at least a big part of the casks which went into it are)! Yes, definitely better than the 12yo, although there is still that initial strong impression of wood varnish… and even glue! Nutty, but also drier and more winey than the younger version. Rubber-coated medication bandages, overripe red apples, some licorice. Palate: Rich and luscious, soft but intense. Refreshingly malty, but also with many fruity notes: oranges, apples, apricots. The oak is less astringent, acidic and sharp than in the 12yo. Belgian double malt ale (Chimay? ), English bitter, nuts. Finish: Increasingly spicy, and no marked bourbonish or cedary notes. Comment: The extra years of maturation and the higher percentage of sherry casks in the vatting make a big difference compared to the younger version. A rich after-dinner malt, but not too heavy or extreme to scare away lovers of delicate whiskies. Apart from the nose, it could almost pass as a Scotch single malt. Score: 86 points. Nose: Salty, slightly peaty and seaweedy, sort of Bowmorish. Getting nuttier, minty and slightly winey with time. Palate: Very nutty, full of integral breakfast cereals (the unflavored kind, of course) and sort of flowery. Again, slight peat (almost imperceptible, like an old style Bruichladdich or a Bunnahabhain). Integral bread. Finish: Bitterish in a freshly poured dram. After a couple of minutes in the glass, delicately malty and slightly oily. Comment: Perhaps the less “distinctive” bottling in this comparison, but still very enjoyable. Highly drinkable and screaming “quality”. Score: 82 points. Nose: A bit too alcohol-dominated, even with water. Evident sherry and peat. Denaturated alcohol. Similar to some well-peated Juras. Give it time, and it will develop into sandalwood, licorice, incense, old furniture and even a hint of Brora-like waxiness. Palate: Syrupy, oily, thick. Spent ground coffee, huge fireplace smoke, then a dark and brooding sherry influence. Raisins, mint, camphor, propolis, rubber bandages, sandalwood and lavender (no, not the unpleasant FWP of some Bowmores!). Finish: Long, extremely smoky… I feel like I have eaten lots of unsugared licorice and then smoked a pack of Gitanes! Comment: A true powerhouse! One of the most intense malts I have ever tried, even with water! On the palate it reminds me a bit of Talisker 20yo 1981/2002 (62%, OB, Sherry, 9000 Bts. ), but more peated and perhaps slightly better integrated… though not for the faint of heart! Score: 91 points. Nose: Buttery biscuits, herbal liqueur. Give it time (and a splash of water) to release wood polish, old furniture, balsamic vinegar, smoke, old leather covered books, dusty and moldy cellar notes, rotten wood, gorgonzola cheese, wasabi and ground white pepper. Palate: This is weird! Incredibly syrupy and thickly sweet, similar to Unicum liqueur, full of gentian root, rhubarb, quinine, burnt sugar and cough medicine! Lots of licorice and honey, deep oakiness. The lovely tannins perfectly complete the picture and prevent this malt from becoming cloying and overly sweet. Finish: Almost unbearably hot even with water, long and warming, again on burnt sugar, licorice and herbal liqueur. Mouthwatering and intense even several minutes after swallowing! Comment: What a weird malt! It’s big, bold, but also extremely compact and with a coherent and well-targeted profile. Not immediately identifiable as Japanese, but neither identifiable as something else… Score: 92 points .